Luke Chaika ’21 and Jon Espe ’20 volunteered through Prepare + Prosper at the Hallie Q. Brown Community Center in Saint Paul to help low- and moderate-income residents file their taxes. 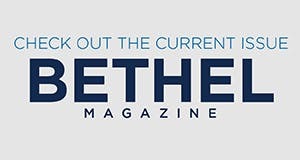 The work continues a partnership that dates to the 1999 tax season and provides students in the Department of Business and Economics a chance to serve others while applying lessons from Bethel. After Luke Chaika ’21 helped a single mother of three with her taxes, she told him she planned to use her $5,000 return to buy new appliances. Similarly, a man told him he planned to use his return to buy a bus ticket to visit family out of state. 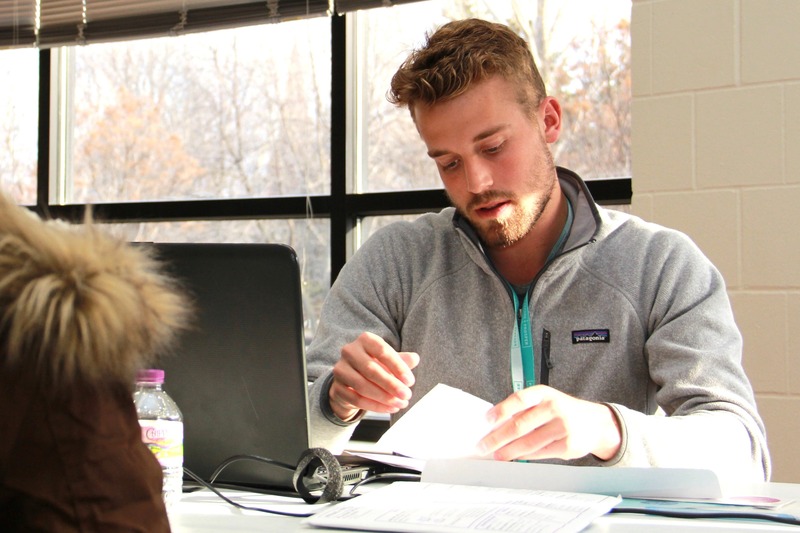 Luke Chaika ’21, accounting and finance major, works with a Saint Paul resident at the Hallie Q. Brown Community Center in the Frogtown neighborhood. 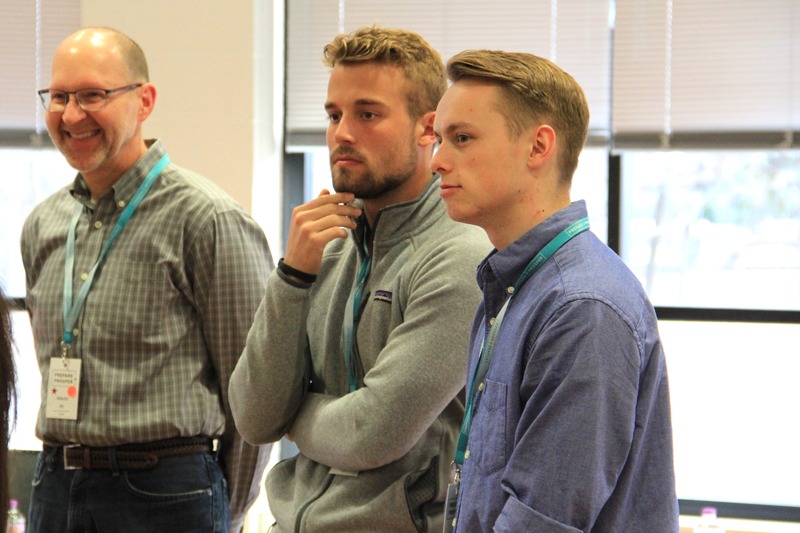 Bethel students who take Professor of Business Leo Gabriel’s interim Individual Tax Preparation course and spring Federal Income Taxes course volunteer each year through Prepare + Prosper, a nonprofit provides financial service help through an array of services to low-income people. For students, the work starts in the interim course Individual Tax Preparation, which prepares them to use tax software and is where they become certified to prepare taxes through the Volunteer Income Tax Assistance (VITA) program of the IRS. Their work continues in the spring Federal Income Taxes course, a business course that meets a general education requirement for significant off-campus, cross-cultural experience. By volunteering to prepare tax returns, students experience diverse neighborhoods like Frogtown in Saint Paul. “This clearly takes them out of the ‘Bethel bubble’ and gives them experiences in diverse communities,” Gabriel says. While helping families, the students learn a lot, too. Through their volunteer work, Gabriel says students enhance their learning by applying lessons. Espe admits working with Prepare + Prosper proved much different than learning in class, and it took a while to get used to the nuances of the experience. Chaika agrees, adding that situations arose at the Prepare + Prosper sites that classroom lessons only briefly covered. “But it’s those situations that are going to help you grow the most,” says Chaika, an accounting and finance major. 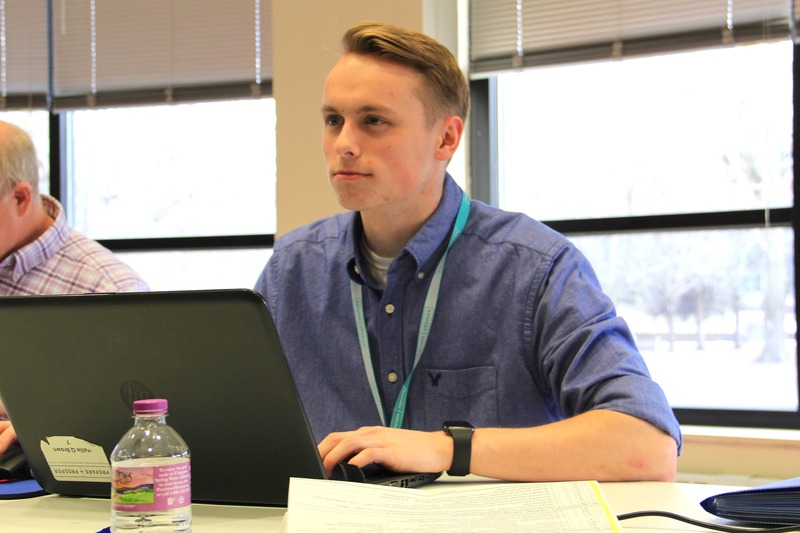 Jon Espe ’20, a business major with an accounting emphasis, looks through a Saint Paul resident’s tax information. Espe says working at places like the Hallie Q. Brown Community Center to file residents’ taxes has added new depth to how he views taxes and tax credits. But taxes frequently change, and the Tax Cuts and Jobs Act of 2017 takes effect this year. While Gabriel says the added discussion around taxes fuels interest from students, it can cause uncertainty for Prepare + Prosper customers who rely on tax refunds from the Child Tax Credit and Earned Income Tax Credit. Though many changes from the 2018 tax reform created benefits for wealthier individuals, the reform efforts raised the Additional Child Tax Credit from $1,000 to $2,000, which Gabriel called a significant increase for families. Prepare + Prosper mentoring programs help customers meet their financial goals. Along with tax assistance, Prepare + Prosper provides financial service help through an array of services to low-income people. At tax sites, Prepare + Prosper helps people open checking and savings accounts, which Gabriel says is important because it is estimated that 25% of the population is unbanked or under-banked. Over the years, many Bethel graduates have continued volunteering with Prepare + Prosper after graduation, while others completed internships or worked full time for the group. Matt Lorenz ’03, a KPMG tax partner, serves on the Prepare + Prosper’s board. “It’s more than just our students going out and doing tax work,” Gabriel says. While Espe and Chaike don’t plan to go into careers directly working in tax preparation, both will consider volunteering with Prepare + Prosper after their time at Bethel. Both enjoyed a meaningful experience and saw their efforts directly helping people. “It’s a really great experience to leave the tax site knowing that you made a difference in someone’s life,” says Espe, a business major with an accounting emphasis. 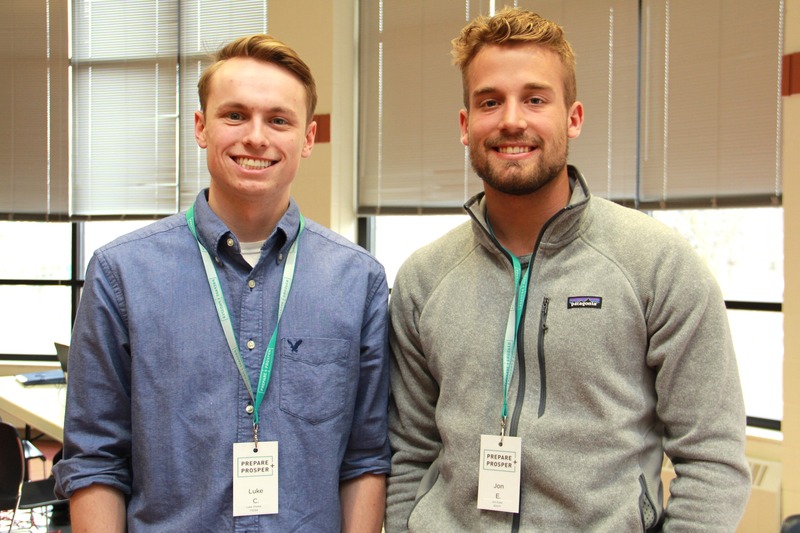 Along with helping others, Luke Chaika ’21 and Jon Espe ’20 say volunteering through Prepare + Prosper helped them apply and use lessons from their Bethel classes. Study Business and Economics at Bethel. The Department of Business and Economics is Bethel's largest undergraduate department, offering 10 majors and four minors. In summer 2018, $4 million in renovations made way for its brand new, cutting-edge space on Robertson Center 3rd Floor. The new space includes faculty offices, collaborative learning spaces, and the Thrivent Asset Management Financial Markets Lab, home to Bethel's Student Managed Investment Fund.